* Information subject to change by the host. * Please double check individual websites for hours and rates. * All venues listed below are available to host birthday parties. What: Indoor play space with multiple bounce houses, a huge climbing structure, slides, and a toddler area. If you have a kid who doesn’t nap anymore, they will nap after spending an hour at Jump 2 It! Children 5 and under only on Tuesdays 9:30-12:30PM. What: Big, bright indoor play park with huge climbing gym, bouncy castle, big slides, ball pit, soft climbing area, and a large dedicated toddler-only zone. Comfortable adult space allows you to keep an eye on your kids while relaxing. Concession includes hot food. Big windows make for an airy, open feel. What: Cozy indoor play space for children 6 and under, including climbing gym and dedicated baby-only spaces. Conveniently located just off Harvey, and small enough that you can watch your little ones the whole time. Perfect for little kids who tend to get bowled over at big indoor parks. 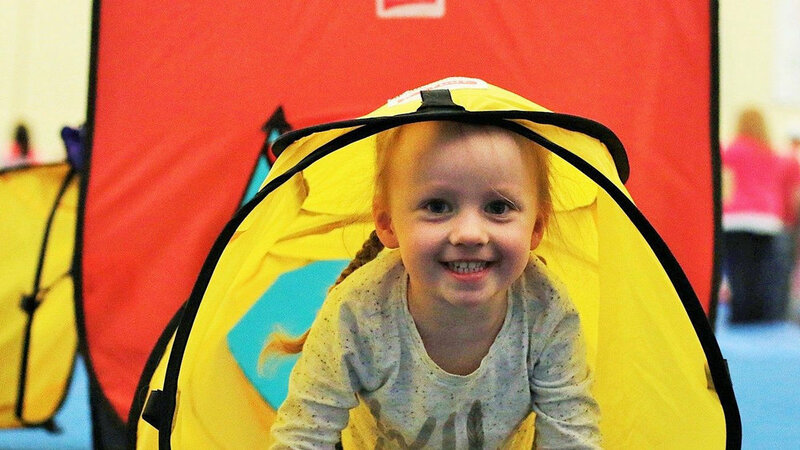 What: Huge indoor play space for both toddlers and older kids, including climbing gym, trampolines, zip line, and more. It’s gigantic! Our kids act like we’re taking them to Disneyland when we say we’re coming to Energyplex. There's tons to do, and it's a great option for families who have both little and big kids to entertain. What: Huge space featuring multiple in-floor trampolines, parkour area, rock climbing, halfpipe and more. One word: Trampolines! (which grownups can go on, too!). Such a fun, bright, inviting atmosphere. Amazing staff are there to help! What: Bright, open gymnastics centre offering drop-in for young kids! Bright, airy gym with a central location. Our kids love when they play Disney music on the loudspeakers. What: Large gymnastics club that opens up for kids’ drop-in! Spacious, airy gymnastics gym offering open, free play for toddlers and children on all its fun equipment. No experience required. What: Large indoor/outdoor fun centre featuring mini golf, an arcade, toddler-friendly mechanical rides, games and more. Perfect for kids big and small. Fantastic indoor mini golf, and tokens can be saved and used for future visits. Great spot for both little and older kids, which is ideal when siblings have a large age gap. Great spot to host a bday party! If you're looking for outdoor fun, there's also batting cages, GoKarts, outdoor mini golf and more. Hey! You might also be interested in….